Always wondered where your favourite restaurant or cafe sourced their gorgeous lamps or quirky ceiling lights from? We have the inside dope folks. And no, it’s not some fancy store with really fancy prices, but good old BVK Iyengar Road on Chickpete. 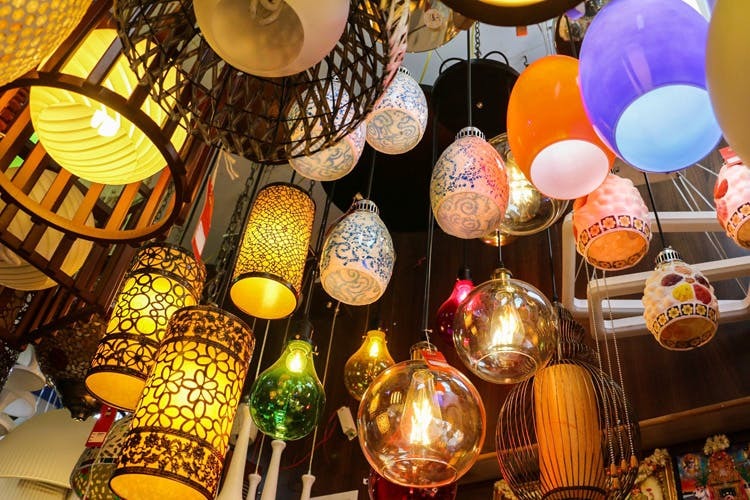 A long road, down which you will find shops selling, lights, lamps and fixtures of every shape and size, budget shoppers, you don’t have to travel light years to find pocket-friendly lamps and lighting fixtures to do up your home, studio or office spaces. If you are looking to make a statement when people swing by your pad, nothing will do it like this larger-than-life, colourful bulb chandelier. The six bulbs on this one are hung at varying lengths. In case the picture is confusing you — it’s the one with the two plain bulbs, one red, one pink, one green, and one blue bulb. Hang it in a nook in your living room and watch it become a talking point, we say. If you want just one bulb (or two), they’ll give you that as well. Pro-Tip: Most lighting shops in this area give you a 10 per cent discount without your grovelling. You can probably snag another five to 10 per cent if you have inspiring bargaining skills. Also, the bigger your order, the bigger your discount. For just a few hundreds, you can pack up these fixtures to add quirk to your bedside. They are lightweight too. So, they shouldn’t cause you too much trouble if you have to move in the future. Pro-Tip: Buying in bulk? Then, many stores around here will deliver it to your doorstep for free. Perfect for your reading spot or your dining space, this geometric-shaped lamp shade will add a touch of class, we think. Similar ones are available in a lot of stores here. Pro-Tip: Across shops, you’ll find that the products are pretty similar for the most part. However, each shop does stock exclusive finds. So ensure that you spend a few hours, combing shops to find what you want. Add a spot of brightness to your bar with this one. We are told that this piece is a hot favourite with bars and restaurants in the city. So, pick yours up before somebody else runs away with it. Pro-Tip: It’s not just bars and bedrooms, BVK Iyengar Road is a great place to pick up garden lights and outdoor lamps too. Want to give your space an industrial feel? These metal lamps will fit right in. For maximum effect, fix filament bulbs. The warm glow will give your home a cosy feel. Pro-Tip: Don’t just stick to the main BVK Iyengar Road, dive into alleys and side roads. You’ll find plenty there too! Looks like we’ve taken our love for Mason Jars to the ceiling now. With this vibrant chandelier, your house can stay on-trend too. Pro-Tip: If you are looking to browse in peace, then, come by on a weekday morning. The shops start raising the shutters at around 11 am. Rom-com fans might notice that this one is similar to the one Julia Roberts creates in Runaway Bride. And even if you haven’t watched the film, you can’t deny that this twisty lamp (you can adjust the bulbs the way you want to) reeks of coolness. Take it home and maybe Richard Gere will come calling. Pro-Tip: If you are hell bent on buying something (especially if it is a splurge like this one) do ask the shop owners to light it up for you and envision it in your space. Three lamps in one! How can that ever go wrong? If you have the space for it, the Zig Zag Floor Lamp will be a great addition to your living room or even your study. Pro-Tip: This was one of the rare floor lamps we found in the area. So, if you are looking exclusively for floor lamps, you may be disappointed. All across the BVK Iyengar Road, you’ll find hole-in-the-wall establishments that sell fairy lights. You’ll get LED and rope lights too. Just stride in and bargain your way to a great deal. Pro-Tip: Do note that with fairy lights and LED ones, there’s a range in quality. So, the cheapest might not be the best. Do take out the time to go through the offerings and pick what suits you the best.